La Biche is a tiny islet off the coast of Guadeloupe, an overseas department of France. 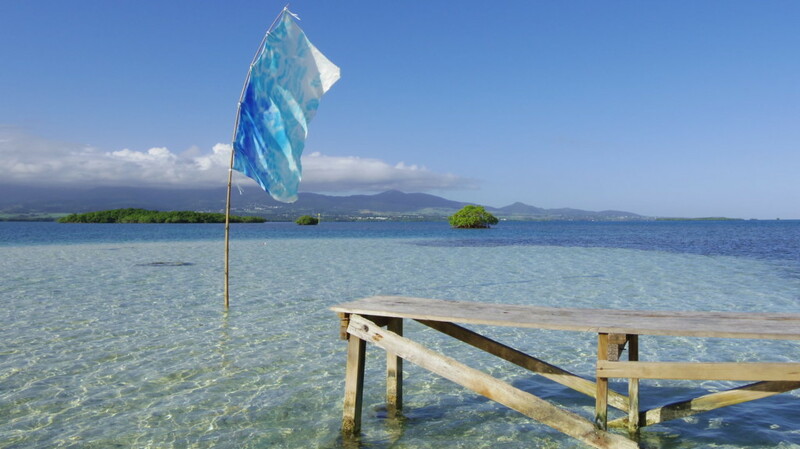 On the north side of Guadeloupe, a broad lagoon forms the Grand Cul-de-sac Marin nature reserve and contains a number of islets marked by mangroves. 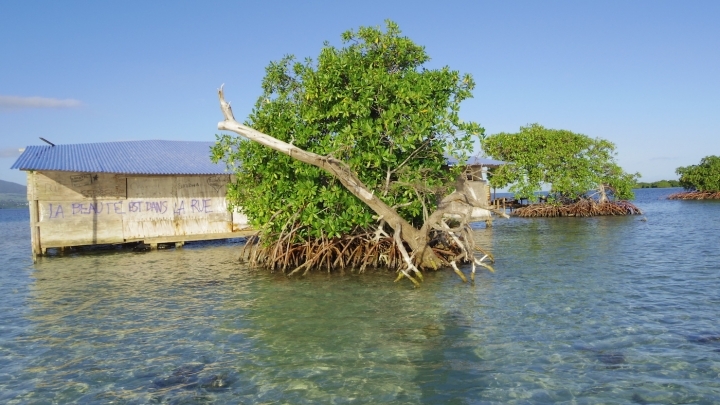 Among them, La Biche actually has no land above water, but is home to a deserted wooden shack. 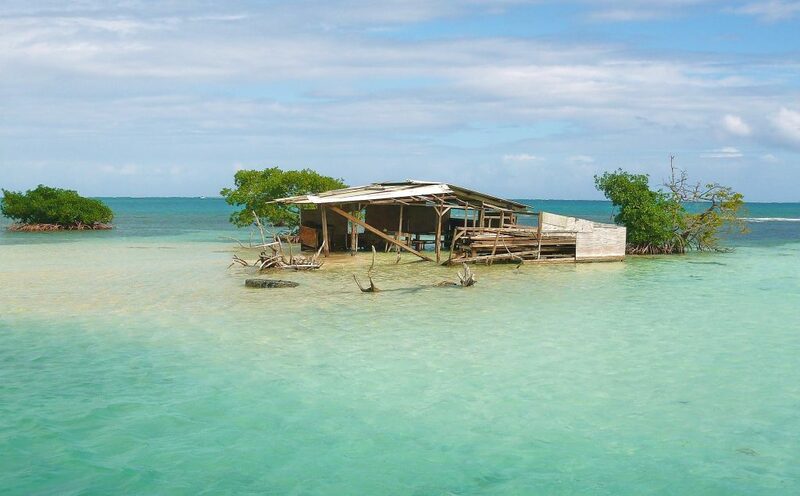 For now, the tiny island and its shack are also home to an exhibition of works by 14 artists. The Biennale de La Biche indicates with its title, In a Land of, its geographic isolation as well as its distance from the systems of the art world with 150 other biennales. It opened on January 6 without a press preview, private opening, or even an end date. The works are expected to stay and decay on the island, and it is unlikely that many visitors will see them in the meantime. The founders and curators of the Biennale de La Biche are Alex Urso and Maess Anand, artists who both live and work in Warsaw. They enlisted 12 artists, in addition to themselves, to create works that respond to the transience of time and impermanence of the environment. Eight of the artists are Polish, and others are Finnish, French, Icelandic, and Italian. It’s broad representation on an island that is measured in meters and has a population of zero. “Ilet La Biche is a place bound to disappear. 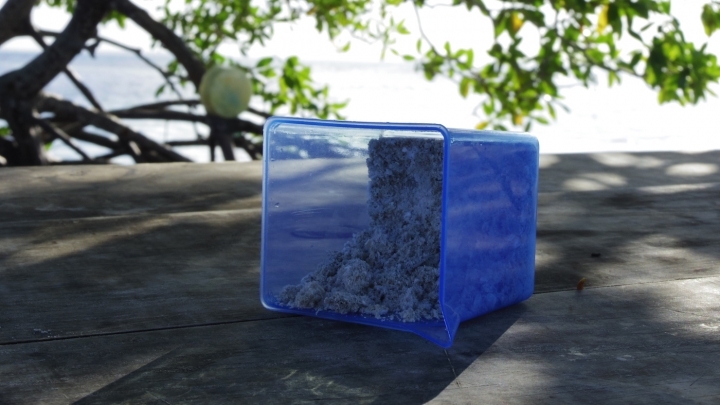 Gradually submerging under the sea level, the island… is destined to become a memory of itself…. It is unknown whether there will be a second edition of the biennale, due to the island’s slow but certain disappearance due to rising sea levels. Each of the art world’s biennales have some appeal, but none of them are more exclusive than the Biennale de La Biche.